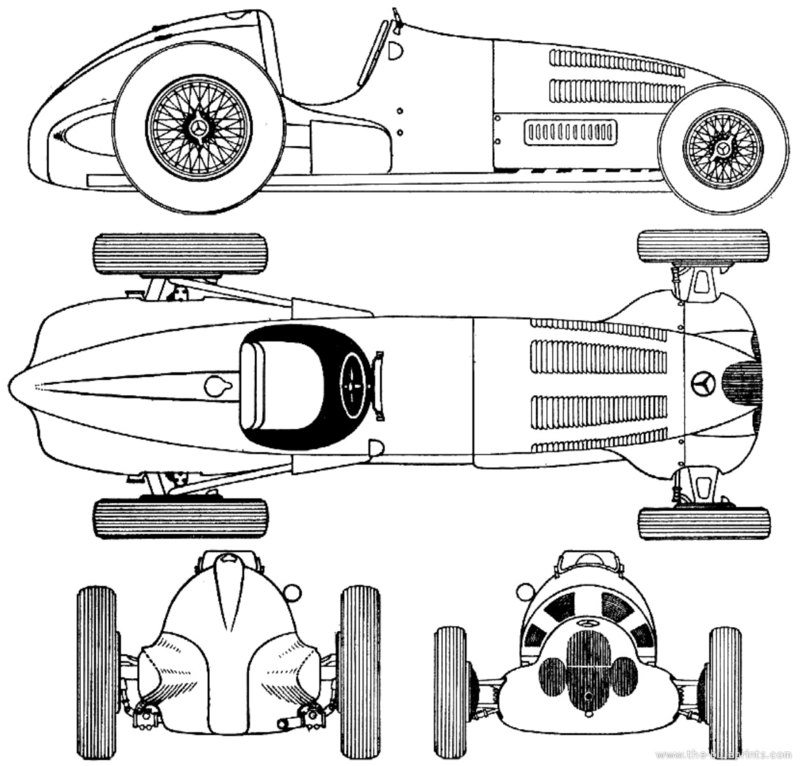 The 750 Kg formula of 1934 to 1937 created an ‘unlimited formula’ of the type only replicated by the Can Am Series of the mid-sixties to mid-seventies. 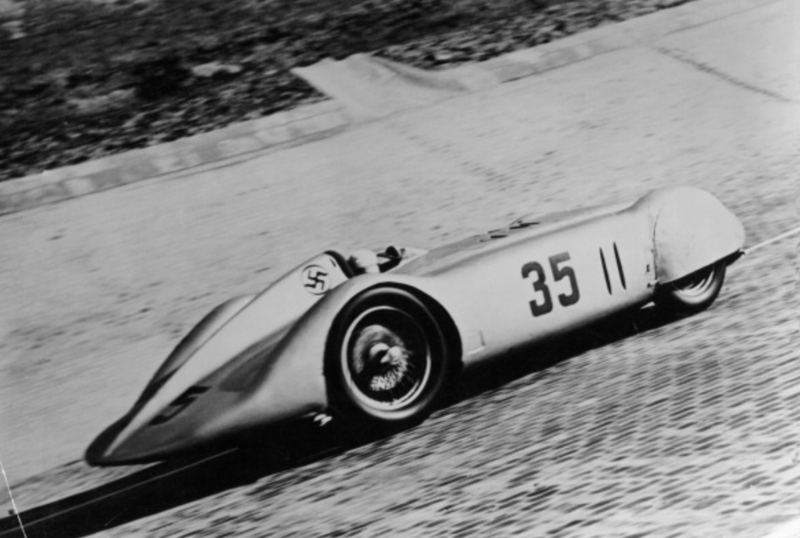 The class was minimum weight based which meant the German teams of Auto Union and Mercedes Benz, bouyed by Government subsidies and rapidly advancing military technology were able to build very light and powerful cars…far more powerful than the regulators had imagined or intended! 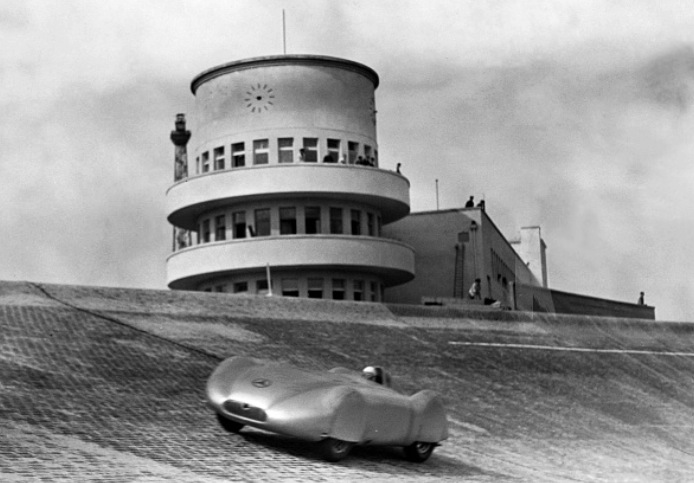 The mid-engined, radical Auto Union ‘P wagen’ was launched in late 1933 to critical acclaim. 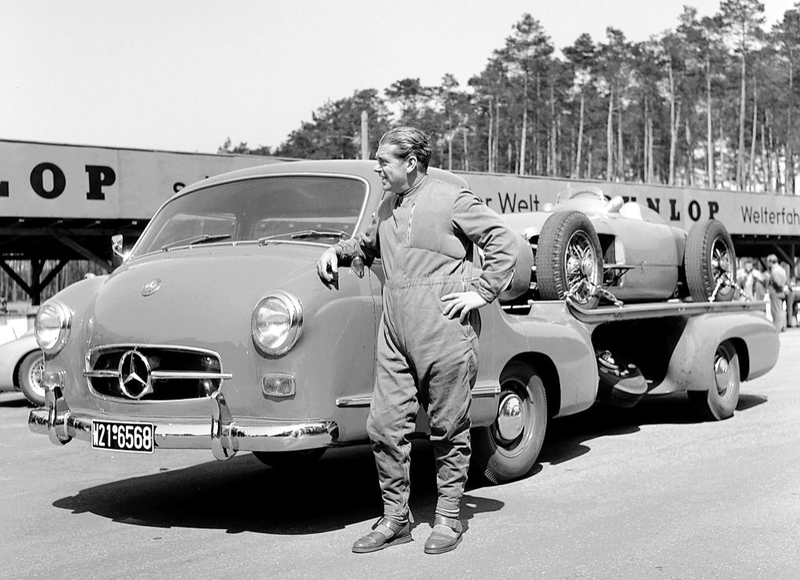 Mercedes approach was more conventional, the W25 a front-engined car powered by a DOHC supercharged straight-eight which initially developed circa 315bhp @ 5800rpm. Suspension was all independent by wishbones and coil springs at the front and swing axles and reversed quarter elliptic springs at the rear. Hydraulic drum brakes were used. 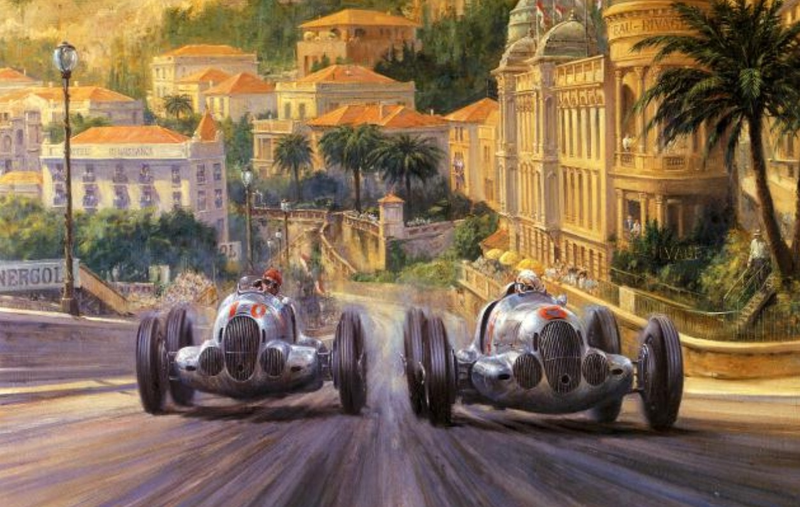 The cars won 4 Grands’ Prix and 2 Hillclimbs in 1934. 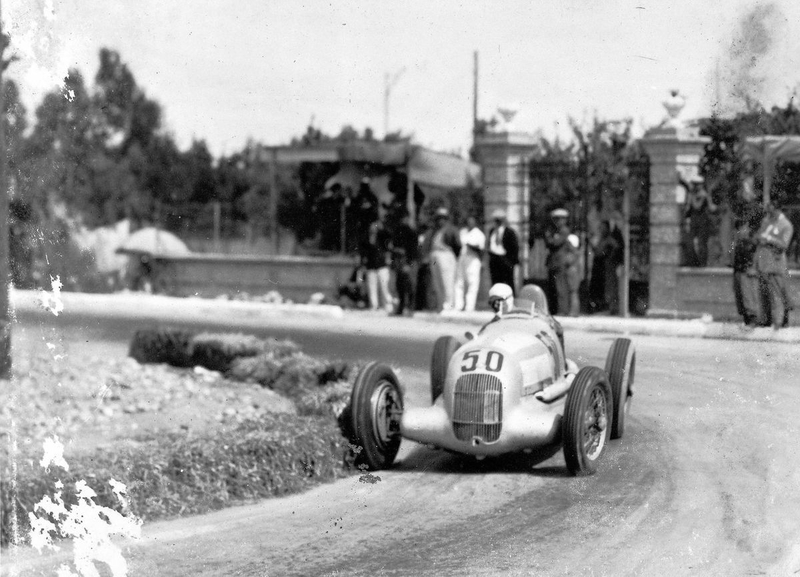 In 1935 the W25 was further developed, Rudy Caracciola won the reinstated European Championship. 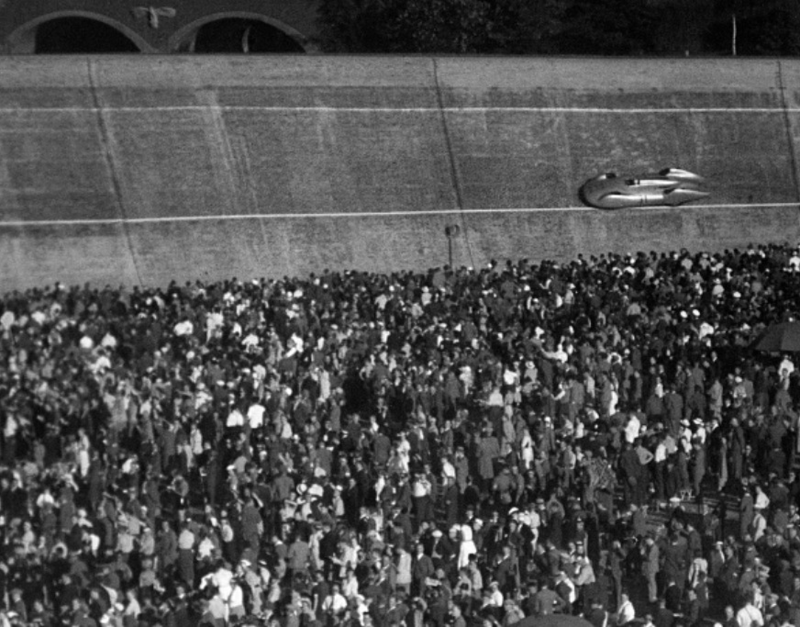 Tazio Nuvolari’s famous 1935 German GP win aboard his Alfa Romeo P3 the only non-German car to win a Championship GP from 1935 to 1939. The capacity of the W25, initially 3.4 litres increased to over 4 litres developing over 400bhp. The M25 straight-8 became unreliable when enlarged to 4.7 litres and 490bhp. 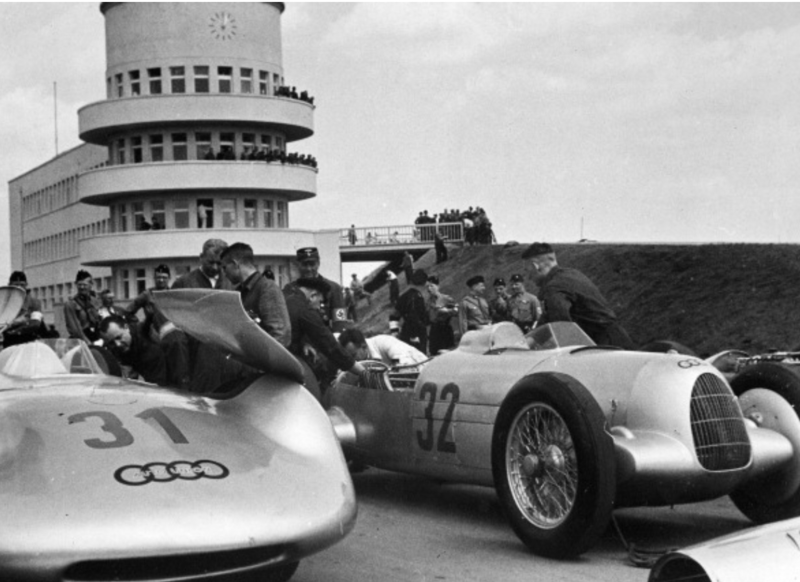 A 5.6 litre, 600bhp V12 was tested but the cars, the chassis shortened (becoming so small Caracciola couldn’t fit comfortably in it) and lightened became uncompetitive with reliability, engine and handling dramas, Auto Union winning many races. 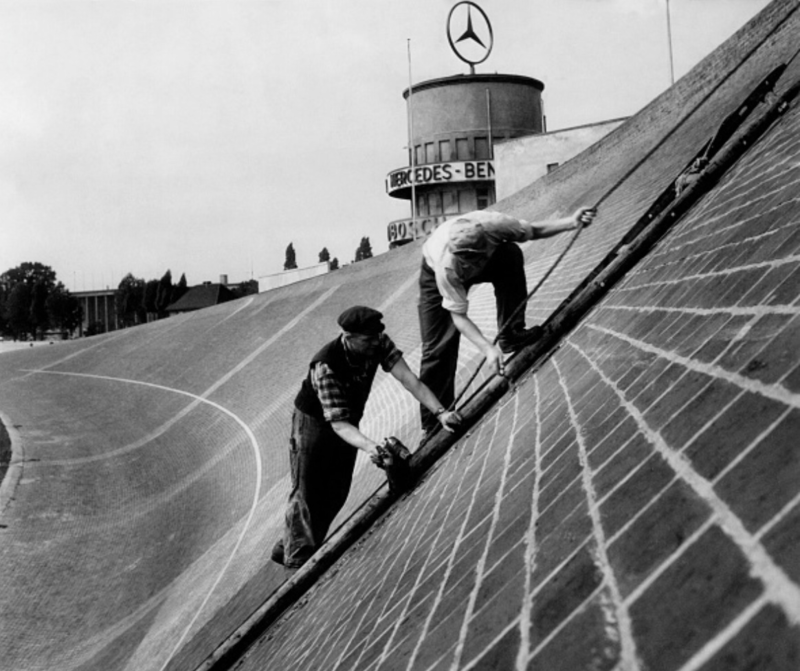 After the 1936 German Grand Prix, a catastrophic home race for the team, the best placed Mercedes-Benz in 5th position, it was clear that radical changes had to be made to the Mercedes sporting organization. 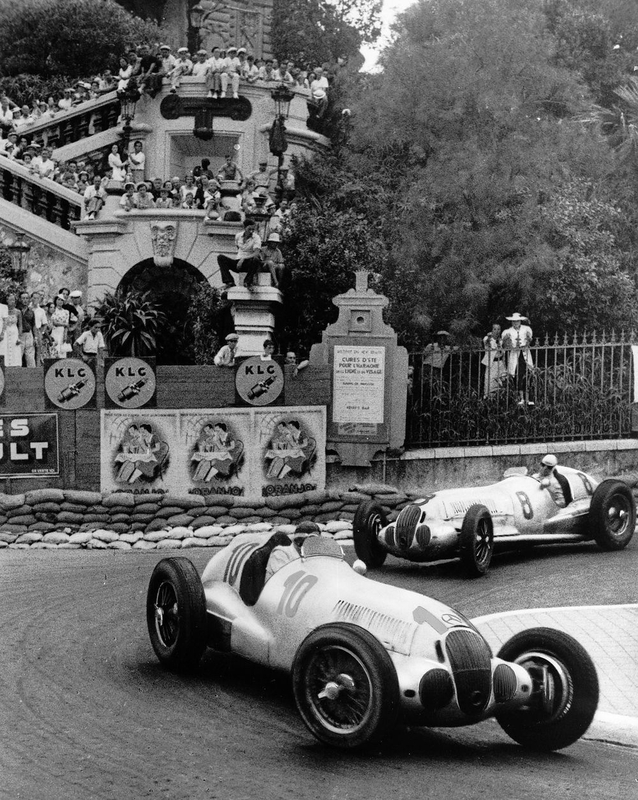 Management started by looking at the structure of their racing departments, the same issues of lack of nimbleness, communication and decisiveness which have dogged bigger companies such as Ferrari and Renault in recent decades are not new. 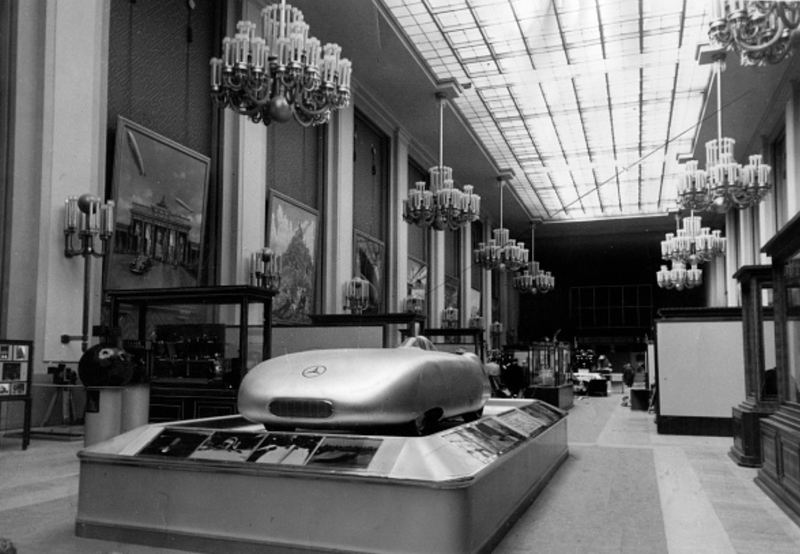 The organization used by Mercedes in 1936 had its roots before the First World War. 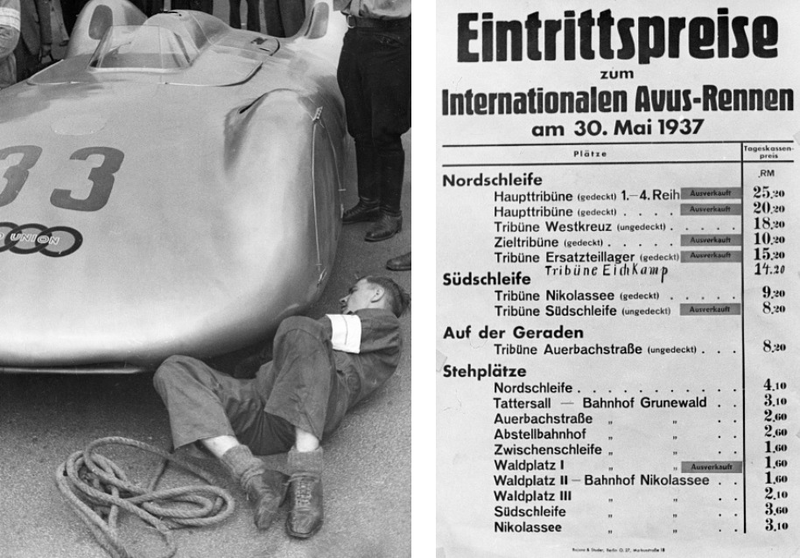 After the death of Hans Nibel in 1934 the central design office was managed by ex-driver Max Sailer. 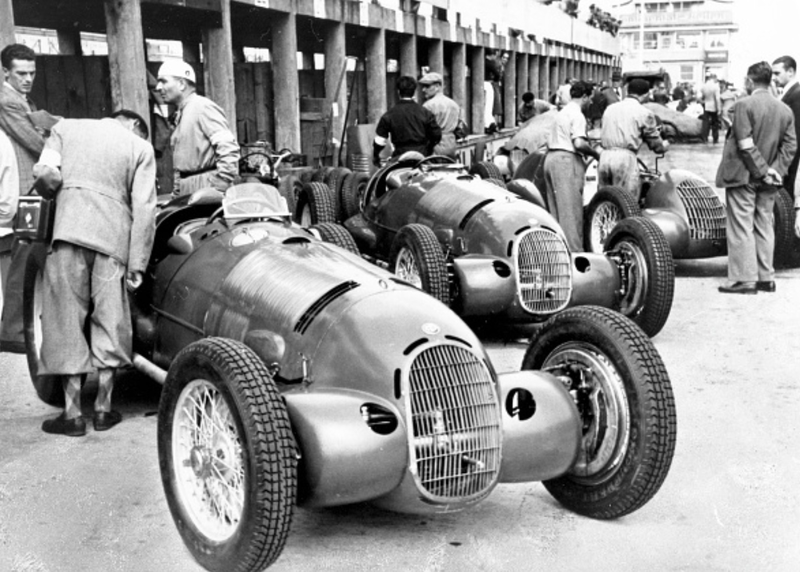 Under him Albert Heess and Otto Schilling were engine design chiefs with Max Wagner the chassis supremo. 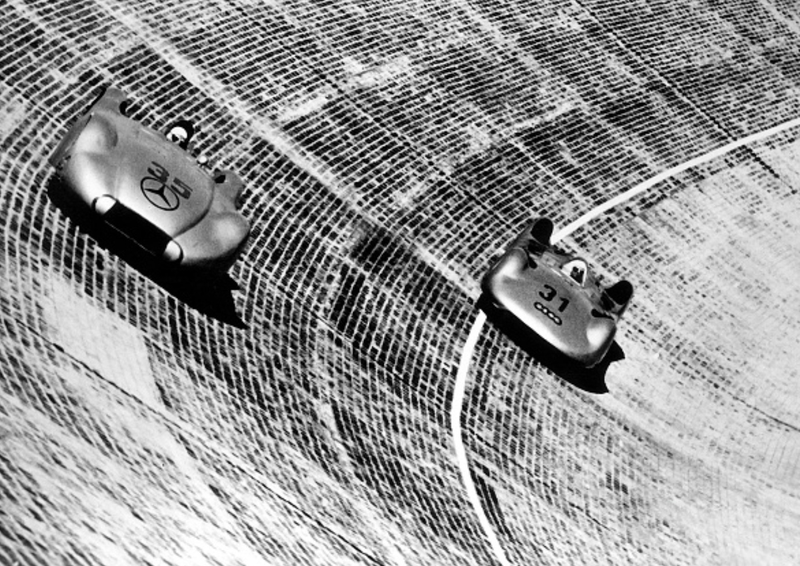 Construction, assembly and testing of the cars were handled by the experimental department led by Fritz Nallinger. Jacob Krauss managed chassis construction and Otto Weber engine assembly while George Scheerer, in charge of the dynamometer section, was responsible for engine testing. 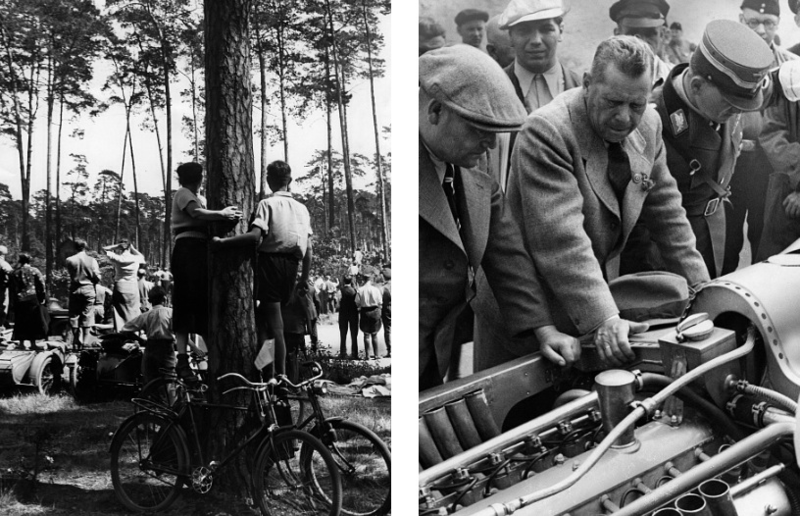 A new technical department between the design office and the racing team was created in 1936. 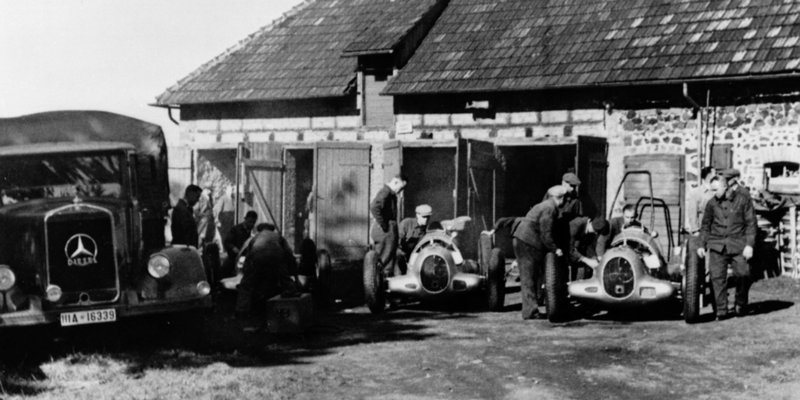 The Rennabteilung (racing department) took over the assembly and testing of the racing cars from the experimental department. 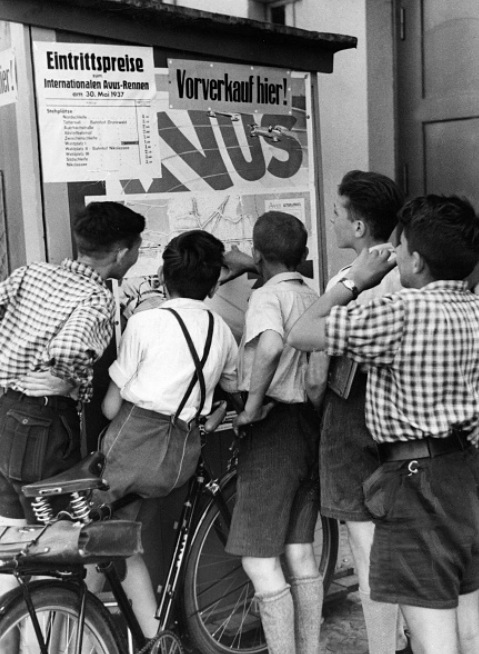 In charge of the new department was gifted young engineer, Rudolf Uhlenhaut. He was born in London on 15 July 1906, (died 8 May 1989) his father German, his mother English. 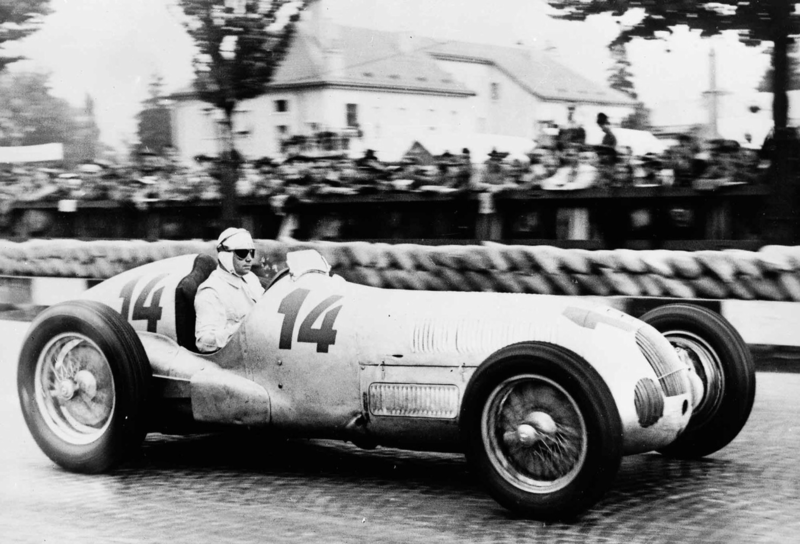 He joined Mercedes Benz in 1931 as a Munich University graduate, until 1936 Uhlenhaut had worked on passenger cars not on any of the racers. 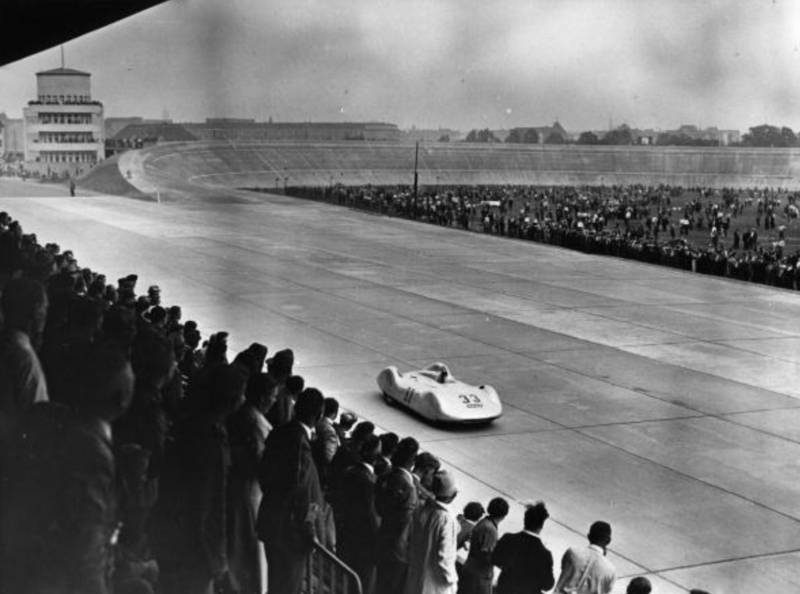 On 12th of August 1936 the Rennabteilung tested one rebuilt 1935 car and two 1936 cars at the Nurburgring with Caracciola and Manfred von Brauchitsch the drivers. Tests included different tyres and shock absorbers. A 60kg lead weight was placed over the front suspension in an attempt to get more front grip. 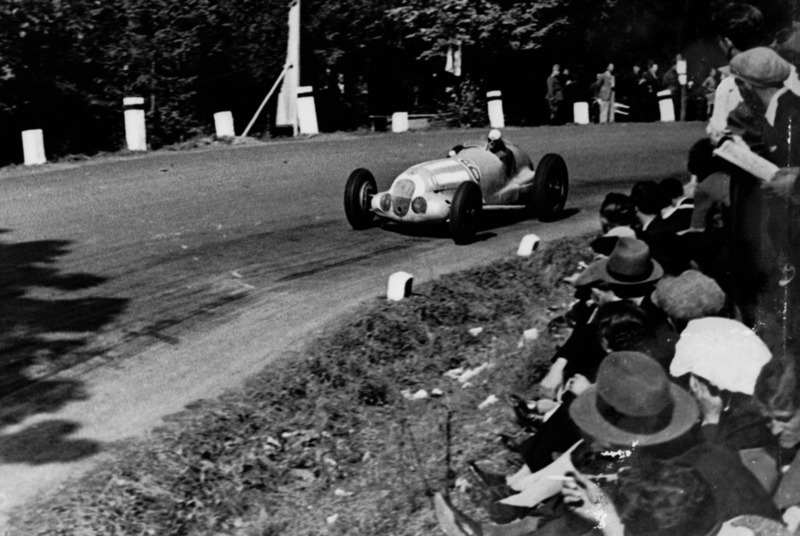 After two days the drivers decamped and Uhlenhaut drove the cars himself. 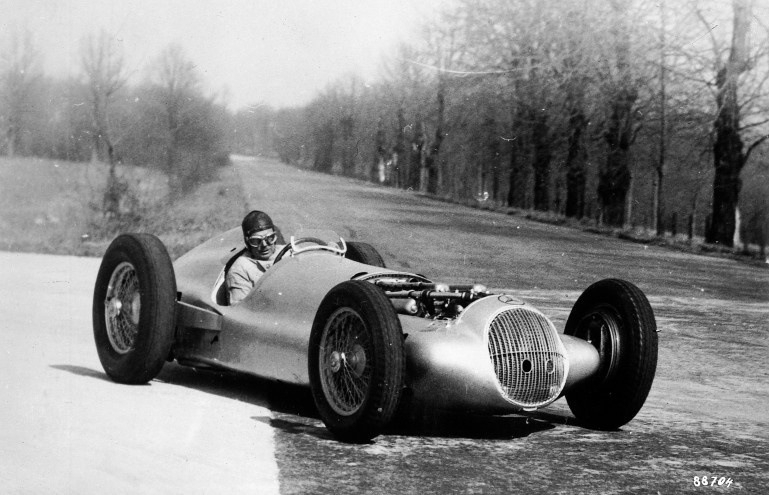 Rudy had never driven a racer before, even though he was used to testing road cars at high speed on the famous circuit. 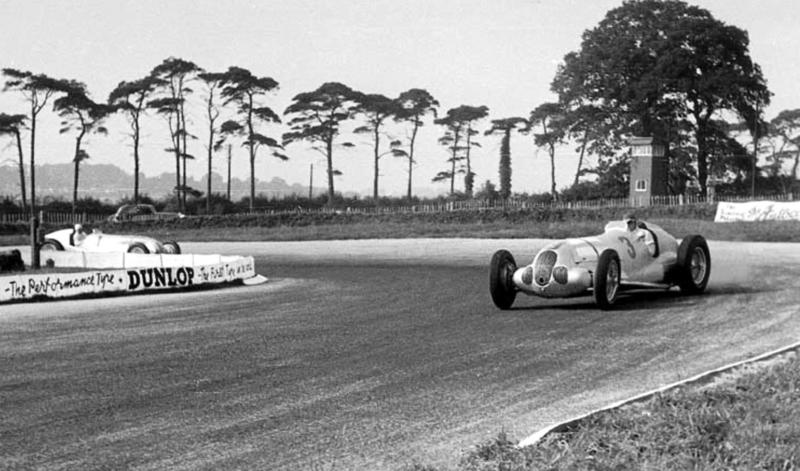 However, he soon settled in and proved to be an exceptionally gifted driver. 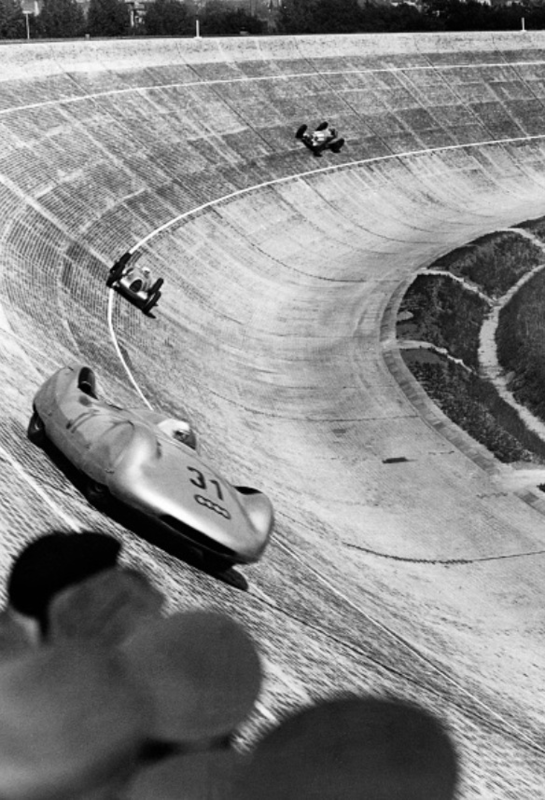 Famously it has been rumoured that Uhlenhaut once went faster than Fangio at the ‘Ring during a test in the mid 50s. Whatever the case, Rudy was a talented tester and potentially a gifted racer had he the chance to strut his stuff, his wife and corporate commitments barriers to a racing career. Uhlenhaut concluded as follows in relation to the W25’s he drove; toe-in changes caused by the old steering geometry were too big whilst suspension travel was too little making the springs bottom. The chassis was bending during braking. 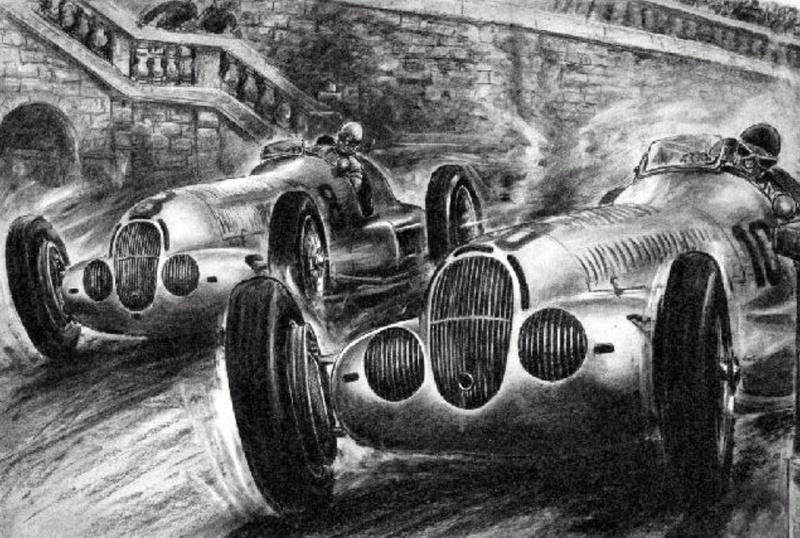 The experimental department had tried to solve the problems by using both hydraulic and friction dampers and harder and harder springs exacerbating the handling problems and violent kickback to the steering wheel. At the rear the attachment point for the De Dion axle could bend as much as 7-10cm during braking. Because the suspension was so stiff the wheels couldn’t follow the road. 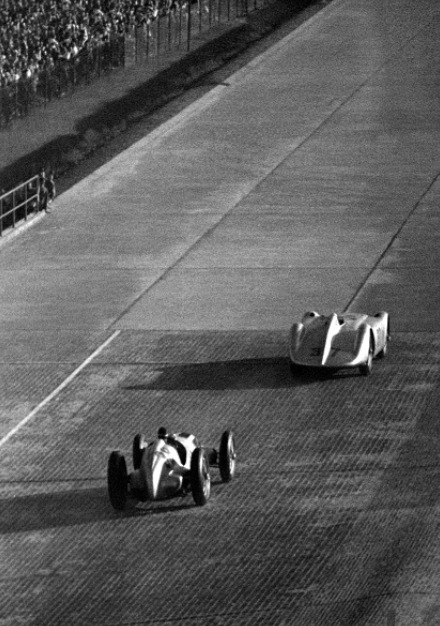 Again, famously, once during Uhlenhaut’s tests a wheel came off at high speed yet the car continued on three wheels as if nothing had happened. 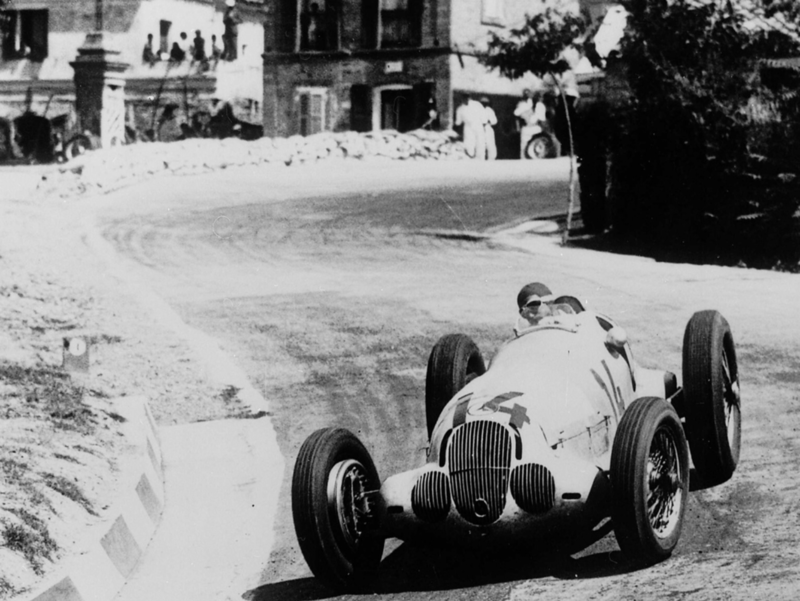 After the 1936 Swiss GP ended in emphatic victory for Auto Union Uhlenhaut suggested further racing that year was pointless. 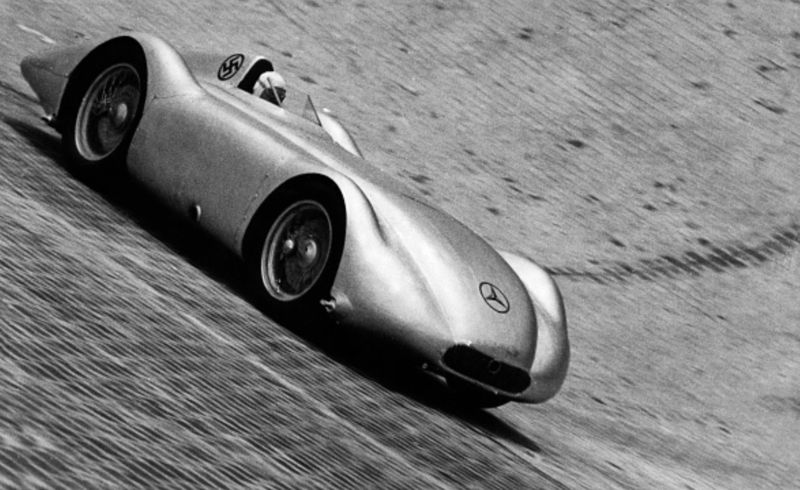 So Mercedes retired from the season to focus their efforts on the 1937 car, the W125. 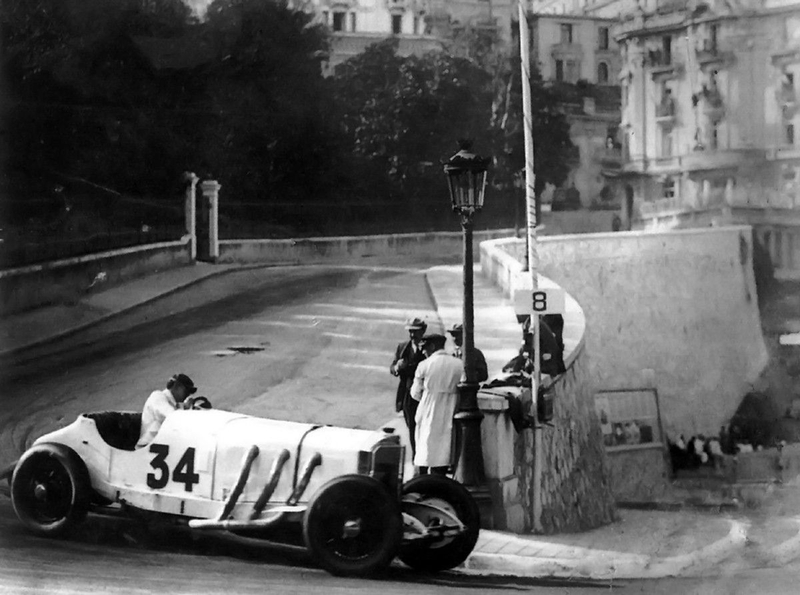 Uhlenhaut’s assessment of the changes required resulted in a long wheelbase car with reduced polar moment of inertia. The chassis frame was much stiffer. The front suspension was new with greater travel and much softer springs. The car had hydraulic dampers only. The gearbox was changed to a constant mesh type improving reliabilty. 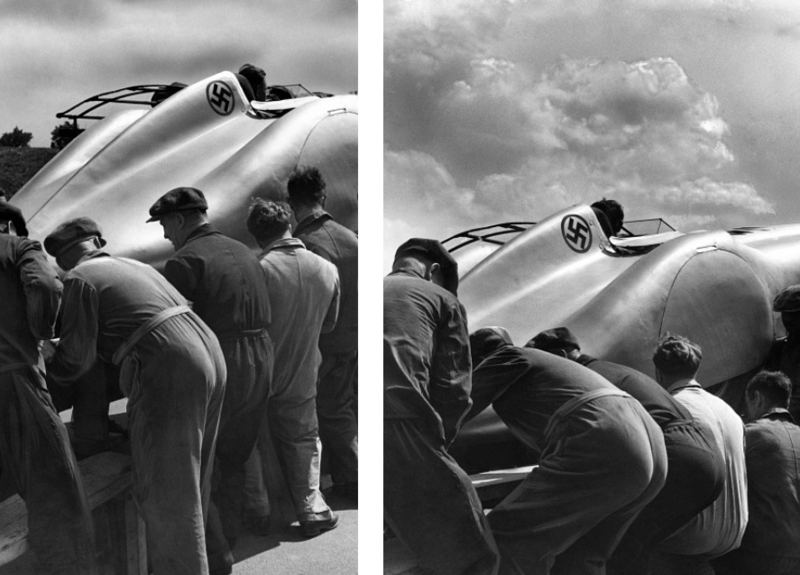 During the season a new suction-type supercharger that proved superior to its precursor was also fitted. 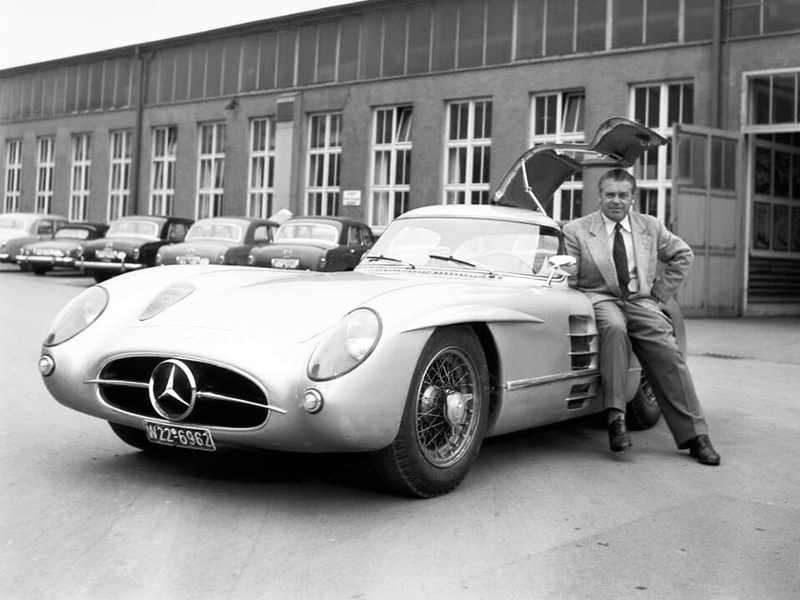 The W125 was the first of the MB GP cars to have a tubular frame; of oval section nickel chrome-molybdenum steel of 1.5mm section. 5 cross tubes braced the frame. The independent front suspension was again by way of unequal length wishbones, 8.45 inches and 10.59 inches in size upper and lower. Coil springs were used. Both hydraulic and friction shocks were used at the front, sometimes hydraulic shocks only. 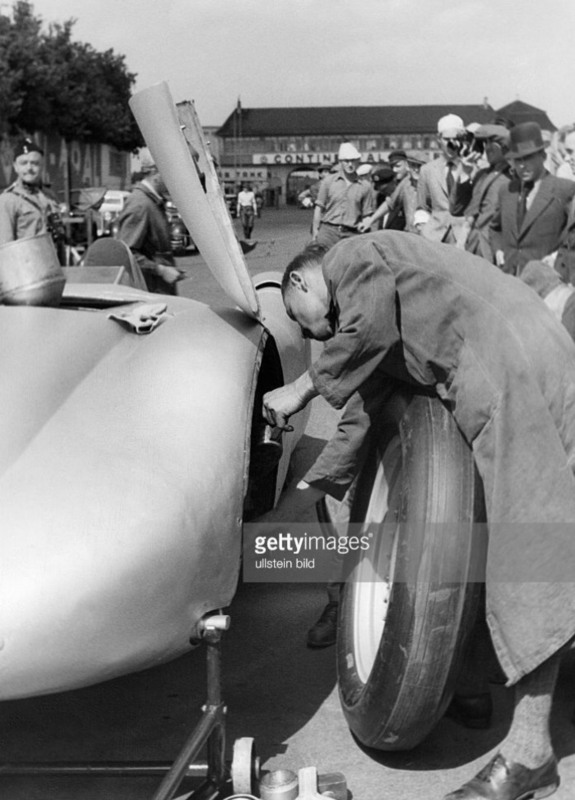 Rear suspension was De Dion tube, the 2 end halves forged and machined from a single piece of nickel chrome-molybdenum steel. Two channel section radius rods provided fore and aft location with torsion bars, 33.2 inches long and 0.67 inch wide, providing the spring medium. Lockheed hydraulic brakes were used, they were of 2 leading shoe type, had Iurid linings with alloy shoes and drums, the latter had steel liners shrunk in. 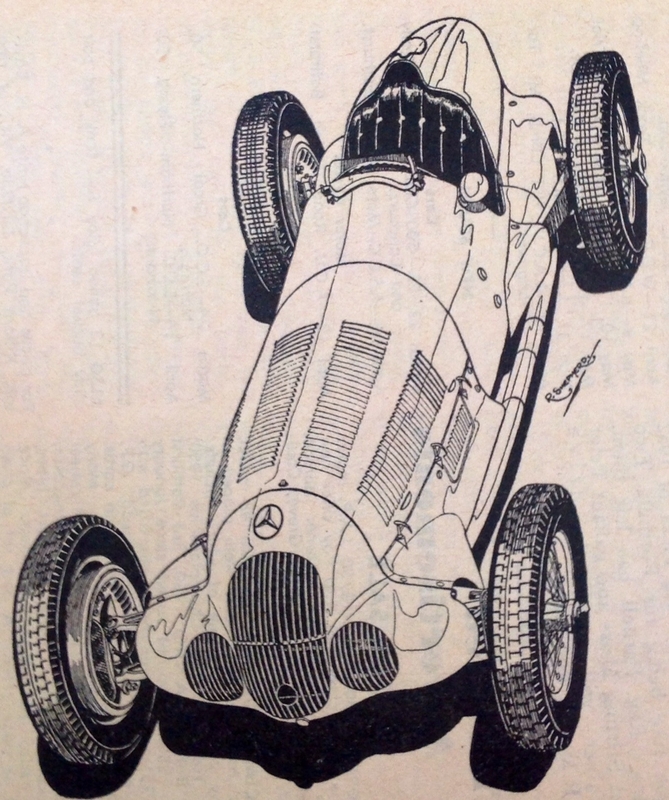 It is perhaps indicative of preoccupations of the time with engines that about half the ‘Australian Motor Sports’ article which provided the basis of the cars technical specifications, is about the M125 straight-eight engine! 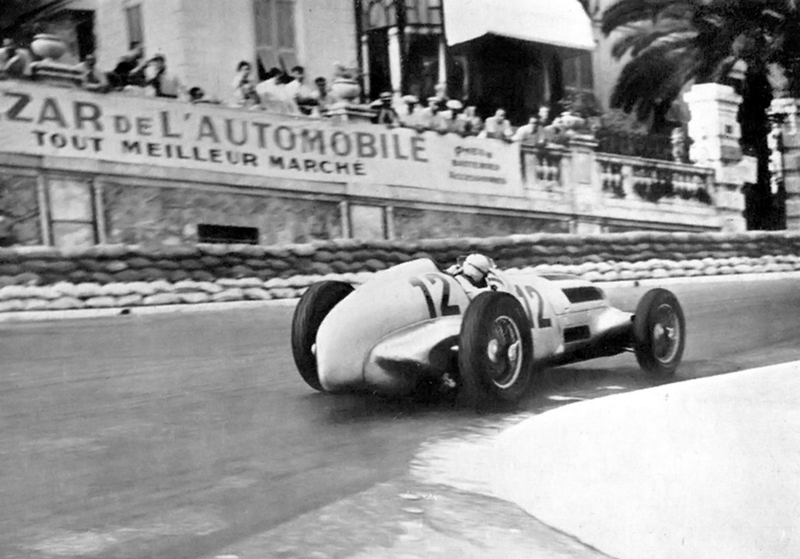 The engine, in typical MB practice was made up of 2 blocks of 4 cylinders, with a bore and stroke of 94x102mm, the engine undersquare, as was the practice of the time, giving a total capacity of 5662cc. The engine developed 645bhp at 5800rpm, the supercharger ran at twice engine speed and was pressurised at 12-14lb per inch. The blocks comprised steel forged cylinders with water jackets and ports welded thereto in sheet steel. The cylinders were spigotted into the alloy, barrell shaped crankcase. The crank ran in 9 main bearings of split roller type made by SKF. Big ends were also of this type. Pistons were provided by Mahle, conrods fully machined ‘H section’ made of nickel-chrome steel and had plain bronze bush gudgeon pins. Lubrication was by way of dry sump with a battery of gear type oil pumps and a front mounted oil radiator. The cylinder head featured hemispherical combustion chambers with 2 inlet and 2 exhaust valves per cylinder at an included angle of 60 degrees. The exhaust valves were mercury filled for cooling. 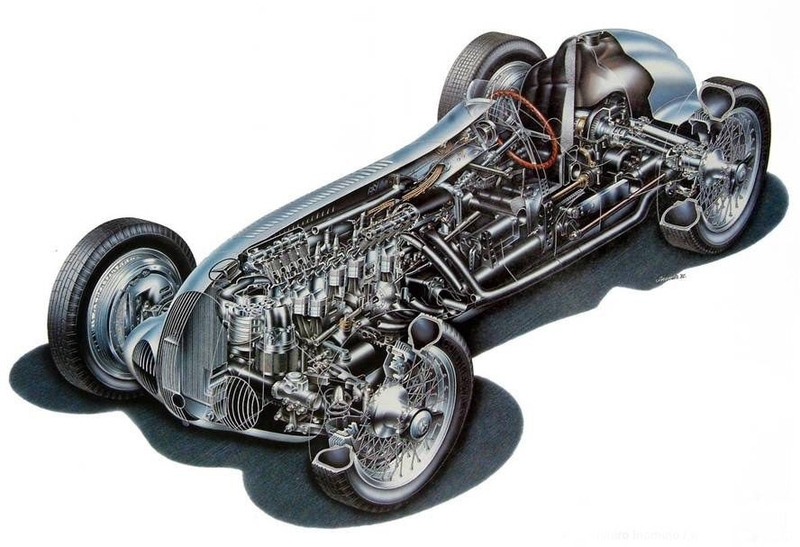 Two gear driven overhead camshafts were used, 1 plug per cylinder was fired by magneto. The heads were not detachable. A Roots type supercharger originally blew air, in established Mercedes fashion into the carburettor but later in 1937, the blower was reconfigured to deliver the mixture in the more usual way. A twin-choke carb was used, the fuel mix a heady brew of 86% methyl alcohol, 4.4% nitro-benzol, 8.8% acetone and 0.8% sulphuric ether…who said fuel alchemy started in the 1980’s!? A single plate dry clutch was mounted to the engine flywheel, the 4 speed gearbox, with ZF ‘slippery diff’ and final drive unit mounted to the rear crossmember. 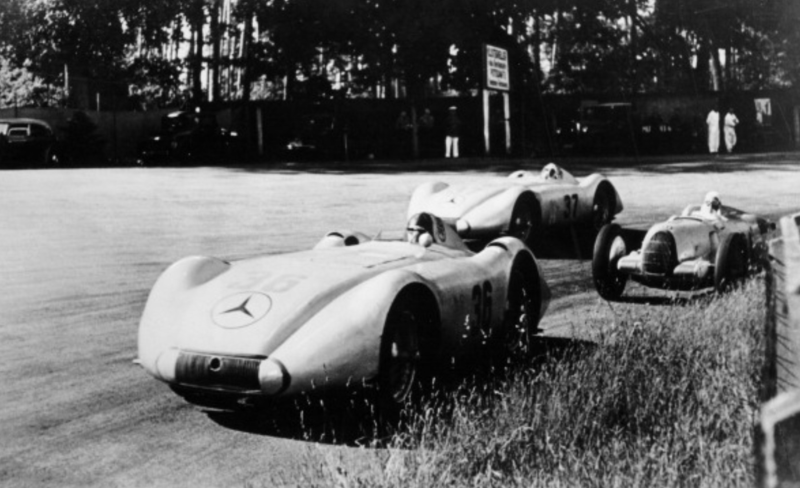 The cars wheelbase was 9ft 2 ins and track 4ft 10ins, the W125 weighed 16.4 cwt. 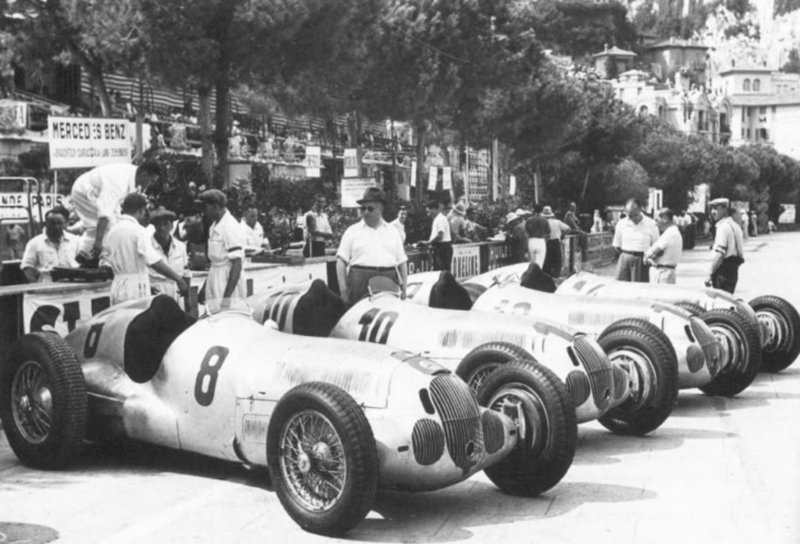 The W125 proved a winner, Caracciola victorious at the German, Swiss, Italian and Hungarian Grands’ Prix giving him his second European Championship whilst Herman Lang won at Tripoli and von Brauchitsch at Monaco. 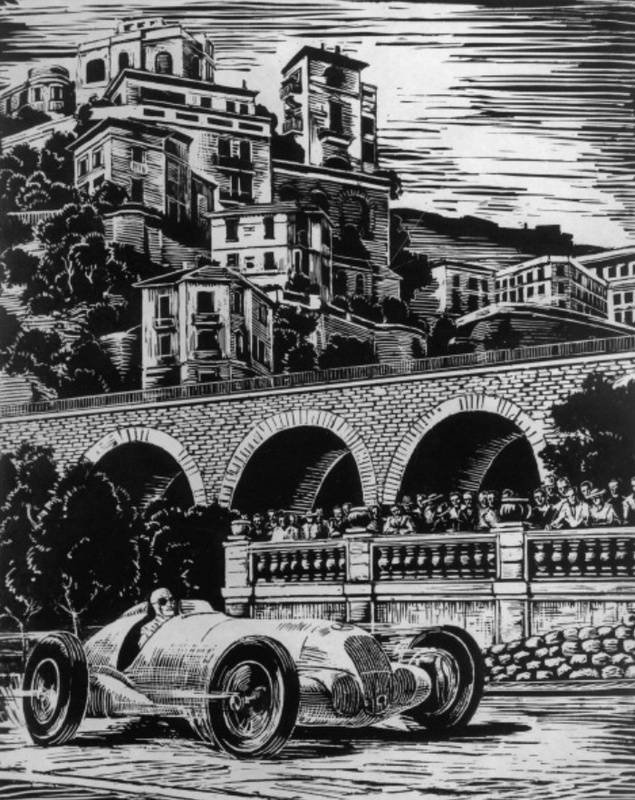 The W125 was put to one side at the end of 1937, in an attempt to slow the cars down, there is nothing new in this!, the authorities mandated a 3 litre supercharged/4.5 litre unsupercharged formula for 1938/9. 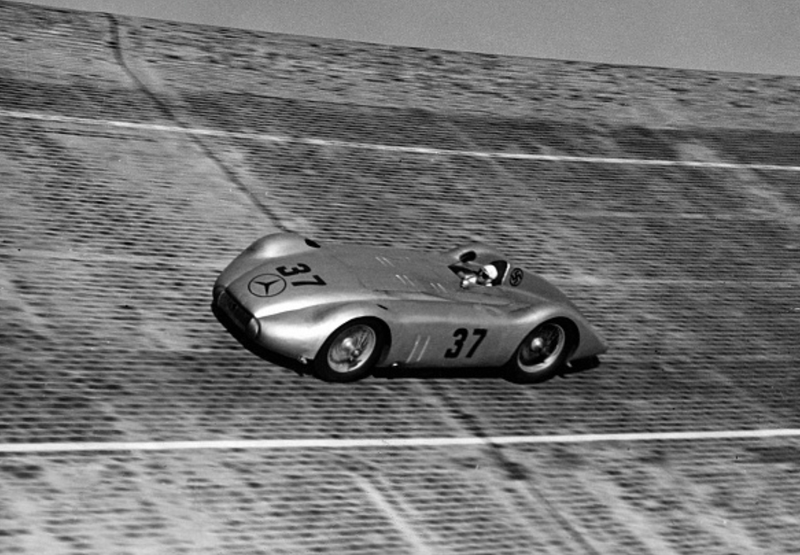 The chassis of the W125 evolved into that of the 1938 season W154, that car powered by a 3 litre supercharged V12 and similarly dominant.